Hip Replacement Exercise generally begins around 6-8 weeks post operation. What can you expect? 2. Do not cross the affected leg over the other leg or cross the midline of the body. This action is called adducting the leg. 3. Do not kneel or get down on the floor for at least 3 months. It may seem there are many restrictions on you for doing total hip replacement exercise in the months following your operation. But...there are still ways you can effectively and safely exercise. Starting with your legs hip width apart and parallel in a standing or side lying position bring one leg away from the body without tilting the body to the side or shifting the hips. Return to starting position and repeat 8 –10 times on each leg. Eventually you can add small ankle weights. When standing you may need to place a pad under the shorter leg to equalize your stance. These side kicks not only strengthen and stretch the hip joint, but there are also many other great core strengthening Pilates exercises to help improve your balance and posture. Make a half circle or shape of the letter ""D" backwards. With your top leg extended over the bottom leg and starting at hip level reach forward slightly, then circle the leg around and up to a 45 degree angle and pull it straight back down over the bottom leg. Repeat this hip replacement exercise each direction 6-8 times on each leg not allowing the leg to raise so high that the top hip rolls back and changes your hip alignment. Standing abduction may be easier to begin with than the lying hip abduction exercises as you are having to lift the leg up and off the bottom one. From no lower than a 90 degree angle in the chair stand up out of the chair and then slowly lower yourself back down using your legs. Try 10 of these to begin with. This can be done with a small ball at your low back, leaning into it with your feet out in front of you and weight on your heels roll up and down on the wall bending your knees slightly but not below a 90 degree angle. Try 8-10 to begin with. Check out my Pilates reformer workout video for the lower body from this page. 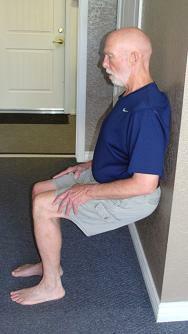 This hip strengthening exercise should be done one leg at a time especially for those with a leg length discrepancy. Standing flat on the floor or on the edge of a step on both or one foot with your heel hanging off the step, slowly raise the heel/s up as you rise up on your toes. Feel the weight distributed equally from your big toe out to the pinky. These foot and ankle exercises are great at improving our balance and strength from the feet up. Find more of my foot exercises in the new foot ebook here. Place a pad under the shorter leg and then standing on your heels raise your toes off the floor one at a time without shifting the hips. This total hip replacement exercise strengthens our most important balance muscle, the Dorsiflexor, on the top of the foot that helps us keep our balance and to walk without shuffling our feet. Most of your hip and leg exercises will eventually be able to include kneeling, getting down on the floor and adducting the leg or bringing it across the midline of the body. These positions should be gradually introduced only after getting clearance from your doctor. Leave hip replacement exercise and find more ways you can benefit from Pilates here.